We build intuitive eCommerce applications with striking designs and unique customer experiences to wow your shoppers. News releases about our customers, strategic partners as well as our products and solutions for the entire eCommerce business. Do you have a drive to build compelling, enhanced solutions for any business vertical? Join our team and see what it’s like to work together. A fully integrated, comprehensive suite of business applications for the enterprise. Sell your product at anytime, anywhere to anyone. EBS R12 has a common accounting engine for all subledgers called Subledger Accounting (SLA). 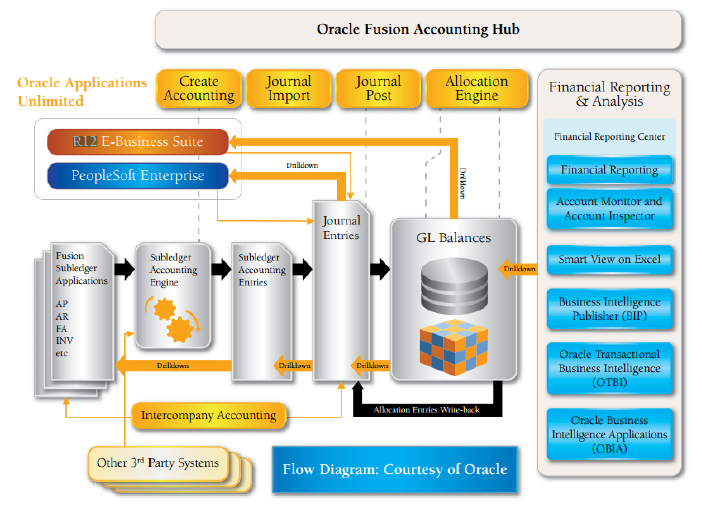 There is also a platform for customers to generate accounting for all their non-Oracle Apps transactional systems using a rule based system called Financial Accounting Hub (FAH) which exposes the SLA rules engine to external systems which enables bringing those into EBS and generating the accounting for multiple systems in one place, using standardized, transparent accounting rules. With Fusion Applications, it fuses the Hyperion BI and Financial Reporting features as well as the powerful PeopleSoft Trees with EBS General Ledger. Fusion provides a way for Peoplesoft, EBS and JDEdwards customers to move to Fusion in an incremental manner, consolidating data from several GL instances into one Fusion system. The result is Fusion Accounting Hub (FAH). This also contains the accounting rules engine for external systems. 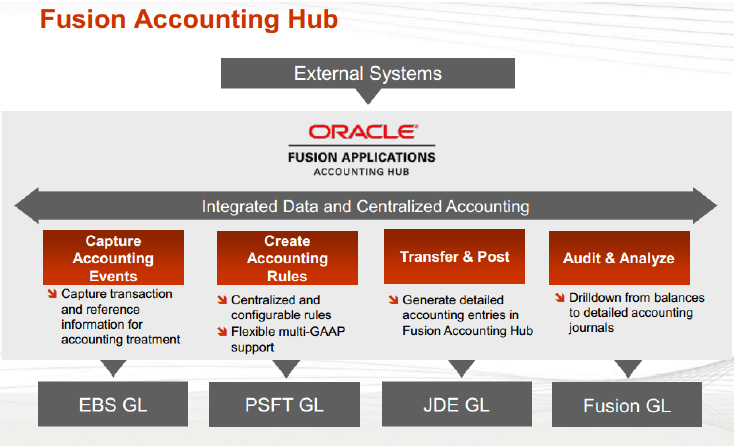 Oracle ended up with the same ‘Accounting Hub’ name for the Fusion product when it really offers a whole lot more and different options, where users can pick and choose what they take advantage of. of the chart of accounts and accounting periods for multiple date-effective hierarchies. This results in extremely fast reports and queries. Reports and analytics can be refreshed on-the-fly without having to run a process or program because the balances have already been pre-calculated. Multi-dimensional analysis is also instantaneous. Users can quickly slice and dice data across dimensions and drill up, down, and sideways on any parent level. 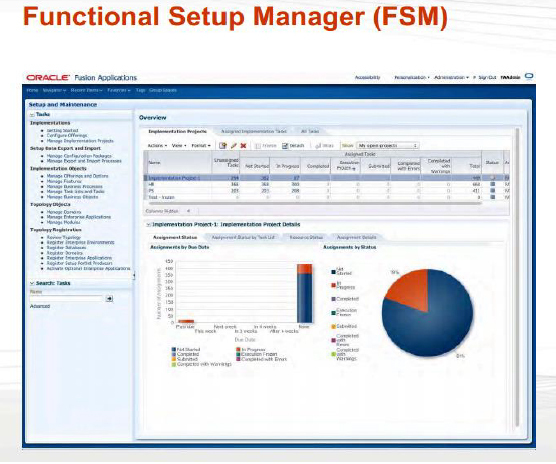 Oracle Fusion Functional Setup Manager is an exciting new feature in Oracle Fusion Applications unlike R12 Financials, that provides a single user interface for performing all tasks related to application setup. This overview provides an introduction to Oracle Fusion Functional Setup Manager and explains the concepts, benefits, and how it works for an application implementer. Lets users change a page layout. Add task flows, portlets, documents, layout components, and other objects to a page. Provide values for the properties associated with pages and the objects they contain. Add a Data composer and make it available for users based on certain criteria. Let end users embed training materials videos to any screens and have it relay it to other users. Change process flow based on GUI. Pre-create, create dashboard reports and make it available to a group or to the entire organization.